And off I go in a new direction--doing my best to go--if not forward--off on a tangent. Since keeping moving is important. I'll admit—the weather (so damn cold) and the outer world (too damn slippy, and hard to negociate) what with mounds of snow, and crazy, incompetent drivers—(I hear them, racing their engines, when stuck—if they ever get traction, they are going to careen off-at 60 miles an hour) and the lack of sun light (Ok yesterday the sun was visible –for a few scant hours) but the days are too short, and too grey—all of these conspire to bring me low. I know it will pass, I watch the sun sets slowly creep uptown. My windows face south west—and I use the NYC skyline as demarker of the sun. In the winter month, the sun never gets out of Brooklyn--(mid summer, it sets north of Columbus Circle!) and while it's slowly moving north--For now, it's still stuck in the outer borough –a social outcast that doesn't have the power or prestiage of a real star. Socks have stalled (at 6 inches) partly because I am pondering the heel. Well a few got done... and I still don't know what I am doing! 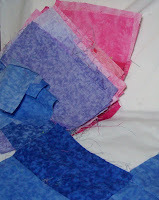 Pretty colors at any rate—from blue to violet to pink to rose.. .
A new and different project always perks me up--hope it works for you soon!